Two very bad things happened recently. According to my friend Tara and confirmed by my grocery store, there is a canned pumpkin shortage. Luckily, the latter problem temporarily corrected the former. So Sol dutifully moved the bottles to the pantry... and then ALL OF THE SHELVES FELL OFF. Disaster. 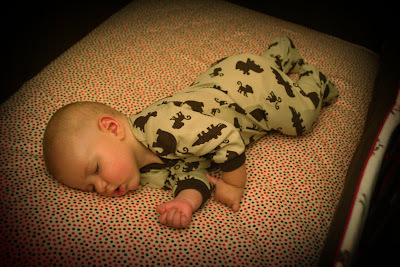 And during the disaster, Finley decided he could not sleep. It was a rough couple hours. We tried to extricate all the food from between the shelves while calming Finley, then Sol fixed the pantry. I neglected to get a picture of the broken pantry. Sol probably would have been upset if I paused mid-catastrophe to document the event. Here is the reconstructed and still-not-really-organized pantry. Now I can make my favorite of all fall treat. Mix it all up and bake at 400 for 20-22 minutes. Oh they are soo good. If you can come across pumpkin on the vegetable black market, you should get some. I really love using photoshop. I had no idea what I had been missing for so long. I would definitely consider myself a novice photoshopper, but here's what I know so far. You can use it to make your own blog header. I have way too much fun and spend way too much time playing around with mine. Victoria and I both buy digital scrapbook kits and use the elements in photoshop to make ours. I think it might be easier to do in another Adobe application, but I don't know how to use any other ones. Actions--I learned it all from my fake friend, The Pioneer Woman. You can download them from her and use them to have all sorts of funky effects. The post I linked to shows her using 9 different actions on the same photo. It's so very cool. I am still learning how to use the appropriate white balance on my camera and get all the settings right. For those times that I fail, photoshop helps me out. I still use picasa if I am editting a picture only slightly--cropping or lightening. Completing the picture. 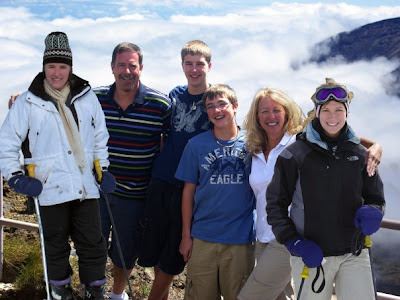 My clever father used photoshop to perfect this family picture in Hawaii. Guess who was NOT invited? So if you are reading this in google reader, click on over and see the new design. And go buy photoshop--its worth the $600. Just kidding, it's not. EDIT: Here is another picture of my brother, Ben, from my dad the photoshop whiz. 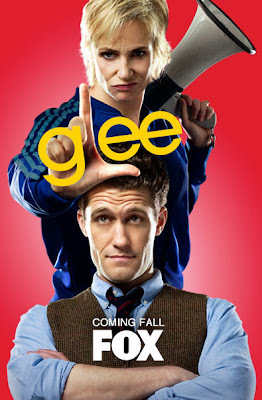 Did I mention that I love GLEE? I'm asking you, very nicely, to consider watching it because as soon as I give my heart to a show, it gets canceled. RIP Pushing Daisies and Veronica Mars. Here's why you should watch it. Please try to contain the wild jealousy within your soul. I'm sorry you did not get to dance to "It's Raining Men" in homemade sparkly tops and capri pants. Les Chantueses really was the most fun ever. We convinced Mr. Forsyth to make it a senior girls group instead of a sophomore girls group so we could stay in it together. And we also got to play with the Clavinova and make awesome car crash and machine gun noises. 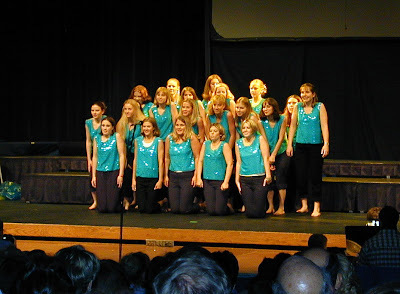 I apologize that I could not find a picture of us in our LOVELY choir dresses with our FANCY jewelry. If someone sends me one, I may post it. Take it from a Les Chantueses, Glee is fun. 2. I love musicals! I realized today that the only time I am willing to buy a WHOLE CD is for musical soundtracks. Mamma Mia, Wicked, Sweeney Todd, Hairspray, Phantom, David Archuleta... And Glee is one big musicals. I love how much they get all the characters to sing! And dance! 3. I love the 80s. They keep using either awesome current pop songs, or fantastic 80s music. Sol even likes it. He just wishes there was more singing. 4. The two main high school kids are RACHEL and FINN. Are you kidding me? Go watch. 5. Mr. Schuester has curly hair and sings and dances. It's cute. 6. There is a celibacy club. Funny. 7. Kurt + Beyonce = Wonderful. 8. It's about teaching kids, which is the world's most important profession. 9. There isn't much else going on at 9 on Wednesdays on FOX. 10. It's a show about a show choir... did I mention that? Really, that's a pretty funny premise. Please go watch it. Save my show. Finley turned 5 months old yesterday! He is such a fun boy to be around. 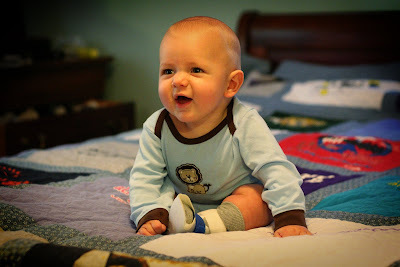 He likes to practice sitting up and standing and he is getting more and more determined to become mobile. He rolls all over the place and somehow manages to lunge himself forward. 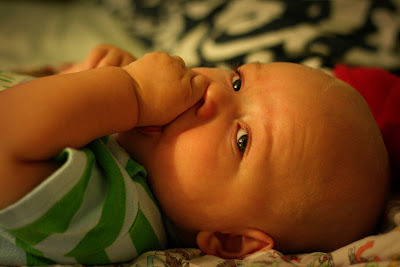 He thinks it is so funny to play peak-a-boo and he giggles like mad when you tickle his ribs. Sol loves to put Finley on his shoulders and Finley loves the view from up high. It's not tough to get a smile or a laugh out of him. Sometimes he'll giggle if you just look at him. 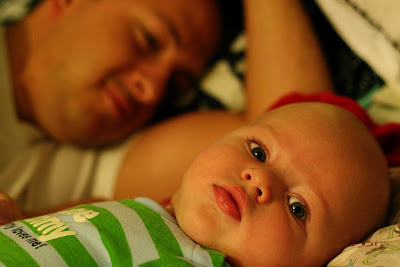 He is the sweetest, warmest little boy when he wakes up in the morning; so cuddly and so very sweet to hold. We really can't get enough of him. His eating and sleeping is still a mess--my friend Carrie watched him today and he ate 1.5 ounces while I was at work. That's about one good gulp out of glass for you and me. The whole day. That's what he ate. And he was happy when I got home. Oh Finley. He is waking up a lot at night, and it doesn't bother me as much as it should. Because he's cute. Cuteness covers a multitude of sins. 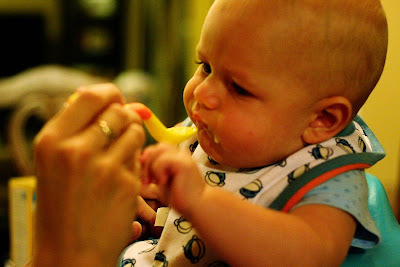 We've had another successful solid food experience--he may like oatmeal better than rice cereal. And I think the spoon we were using was too big. But he's definitely interested in eating, he'll try to stick his hands in whatever we are eating. He can make a pretty good mess if you let him. Time for some pictures. Which I know is the real reason you came here today. But Victoria captured this rare footage, as a reminder that he isn't always perfect. And his birthday was the first day of fall--you know what that means. Football. 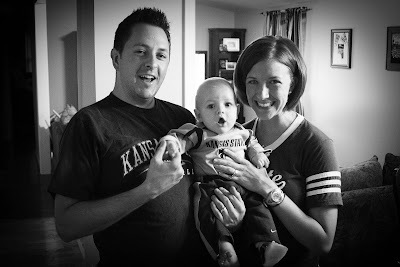 We watched about none of the K-State game, but we sure got dressed for it. We are wearing purple--I just liked the picture better in black and white. I love fall. New tv, marathons, pumpkins, the end of humid terrible heat... it's perfect. I love fall. And Finley too. Mostly Finley, just so we're clear on the order of things. I ran 19 miles this morning--I'm pretty sure it's the 13th time I have ran 19 miles. And I'm finally getting faster! I averaged 9:35 miles, which is a great improvement from the 16:00 minute miles I was turning out when I was 8 months pregnant. I am crazy. It's tough and slow getting in shape after giving birth--and choosing marathon training as the means of getting into shape may have been a bit ambitious. But I'm having a great time and its a team effort so far. 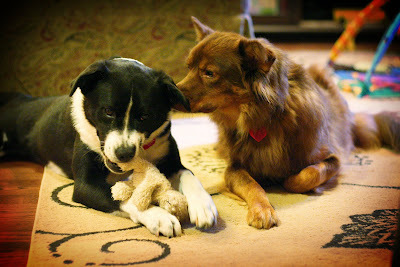 Sol will watch Finley on long runs and sometimes if its a shorter run, Victoria will take him and I'll take the dogs. And sometime I take Finley. It's complicated. This is what fueled my run. I ate some Oatmeal Squares on the way to the trail and brought the Nalgene as a back up water source. 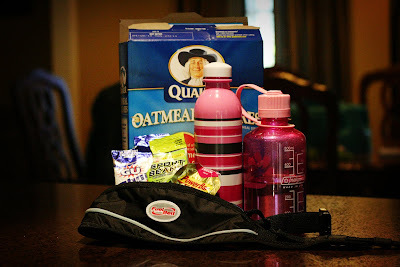 The cute pink bottle is my new favorite--I have two so that I always have one ready to take with me on the run. And, they are dishwasher safe. I bought a "fuel belt" yesterday, which is a euphemism for "fanny pack". I don't buy many runner-y items--sometimes I feel like an amatuer when I see other runners with their fancy clothes and water systems and what not. But I finally broke down and bought the fuel belt to carry my phone, key and snacks. And I'm so glad I did! No more trying to shove a bunch of stuff into the one teeny pocket of my shorts. I love the fuel belt. And I have a new favorite snack to eat while running. I used to only eat GU which is GROSS. But now there are all sorts of things you can take to keep your energy up. My new favorite is the GU Chomps. They are really tasty and easy to eat. Today I had Blueberry Pomegranate. Seriously tasty. I want some right now, in fact. I also ate some Sport Beans and some yucky Power Bar Gel. Pretty much just a whole lot of sugar, but it does the trick. I'm excited for the marathon. I know my time will be slow slow, but it's the first step in hopefully getting a qualifying time for Boston. I'm currently looking for one to run in April. Any suggestions? Look how sweetly Copper is sharing his toy with Belle. He loves that puppy--and by love I mean he has been methodically removing appendages since we gave it to him last November. It's lasted so long, and its his favorite. He looks like such a sweet dog. My babysitter Amy called me today around 3:10 to ask if I would be home soon... Finley's been doing so well that I wasn't sure what the problem was. You guessed it, the problem was my psychotic dog. Sol left Copper in the backyard, and when Amy came home from running errands with Finley, he escaped. Definitely NOT Amy's fault--she's 8 months pregnant and trying to get a baby and her belly in the backyard. And also, my dog is crazy. So he escaped, much like the last time. This time, Victoria and I raced home from school and surveyed the neighborhood--we were pointed in the right direction by three different sets of neighbors. When we located him, he looked POSSESSED. I've said it once and I'll say it again, that dog had indescribable amounts of crazy in his eyes. Buckets. He ran like his tail was on fire and dashed off whenever he saw me. By the time we chased him to the elementary school, we had (somehow) collected a following of elementary aged girls dressed as the safety patrol, trying to help. Copper was finally distracted by another big dog and after several attempts I was able to grab his collar while he met the new dog. And the safety patrol applauded. And I wanted to punch him in the face. He was so thrilled with himself the whole ride home, then pretty much cowered and tried to stay away from me at home because he knew he was going to get punched. He is temporarily, or maybe permanently, banished to the backyard. All he wants to do now is lay on the cool ground and relish in his memories of freedom. 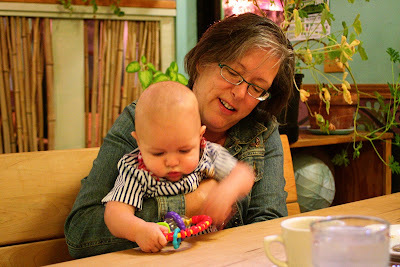 So, our pediatrician recommended letting Finn try solid foods to help fill his little belly and get him to sleep better. He is still sleeping like a crazy man--which means he wakes up every couple of hours at night and won't eat much during the day. The little booger. 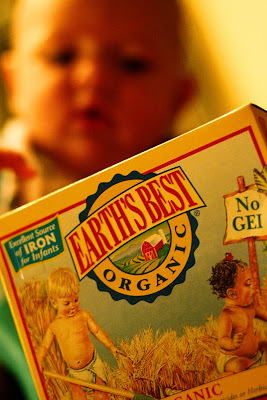 Finley's first food was Earth's Best Organic Rice Cereal. I picked it because the box said babies prefer it. And if they managed to get a baby to express a preference for food, then it must be good. 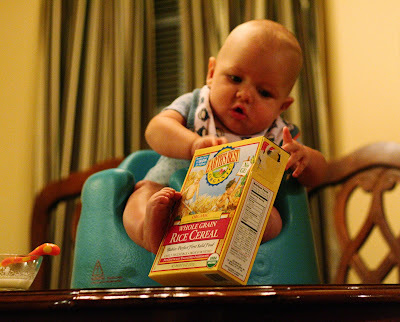 While Finley was fascinated with the box, he was not so interested in eating the actual food. Our first attempt was last week, and it was unsuccessful. But, we tried again today and he ate a good amount of it! And it was cute--he would open his little mouth to get more. It's funny how proud we were of him--I wish people got excited for me when I successfully get about 50% of my meal in my mouth. It's great to be a baby. I came to a devastating realization recently. I don't have time to watch all the tv I need want to watch. So I navigated to the place where the old DVR saves future recordings, and I began to cancel. Cancel. Cancel. And the DVR said, "Are you sure you want to cancel all future recordings of this show?" And my heart cried, "NO!" But my finger was stronger and bid those ill-fated programs adieu. So goodbye, Pushing Daisies. Goodbye, Scrubs and Parks and Recreation. I will miss you, Jon and Kate Plus 8. And why, Samantha Who, why did you leave me? And, The Mentalist starring Simon Baker, you better bring your A-game, because you are next. I spent six years living outside of Dayton, OH. I'm pretty sure my family enjoyed it there--I recall lamenting that my life was over when my parents moved us to Wichita in the middle of my 7th grade year. Of course, Kansas turned out to be a fantastic place to live, I made ridiculously fantastic friends in high school and college and met this guy who is now the father of my child. And I love him and the child a great deal. But anyways--Ohio. 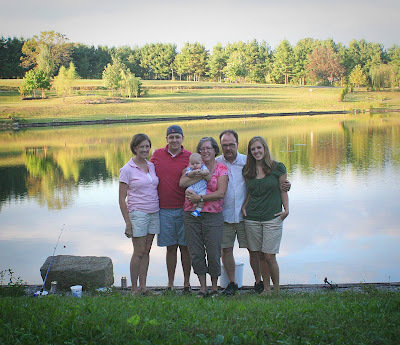 We trekked to southeast Ohio to visit Sol's parents and sister this weekend and I was reminded how much I enjoy Ohio. The landscape is so lovely and it was just a peaceful place to be. I love the rolling hills and the farmy, quaint feel of the little towns you drive through. Sol's parents live on a nature preserve with a lake. It's beautiful--when I left early early this morning to run 13 miles, there was mist rising off the lake. Unfortunately, I was too tired to go back and get my camera. And I don't know how to photoshop mist in, but here's the lake. Sol and his dad went fishing and caught 5 fish. 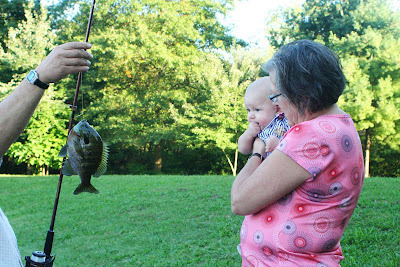 Finley got to meet one and it looks like he likes fish more than me. Fish make me shudder. Ick. There was a great farmers market we dropped by--lots of local farmers and vendors to buy from. We ate dinner at a pizza place called Della Zona, that specializes in pizzas made with local produce. My pizza had all my favies on it--mushrooms, olives, capers... it was so yummy! Finley was so good the whole time and there was never a shortage of arms to hold him. 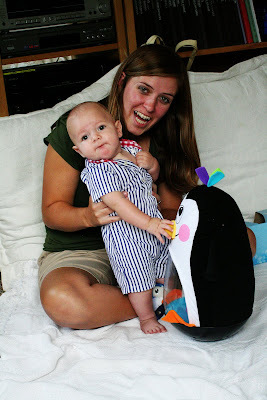 Finley loved his new cool toy--the penguin makes very silly noises when you hit it. Almost as silly as Maya's face. Here is me in both classrooms. I know, who gave me bangs, right? The one in BPS was taken in 2005, a couple weeks into my first year of teaching. And the one in FCPS was taken last week, as I prepared to start year 5 of my illustrious teaching career. Boston was my first teaching job after coming from Kansas. Before I was hired by my school, they made me teach a demo lesson (which I don't think they ever do) and there were bets as to how long I would make it. But I defied all odds and made it three years. If Sol hadn't been relocated to Fairfax, I may have stayed forever. He was moved in January and I stayed until June to finish out the year. The main reason I loved my school in Boston so much were the kids. Even though they were a challenge every day, they just needed some love (and math). And those kids--man, they were something else. I learned much about rap and their funny slang and fashion and how to break up a fight. Standing in front of 25 tough looking kids was intimidating, but when I got to talk to them one on one I realized how precious they were and how much I loved them. I don't think I can adequately describe how much I miss and adore those kids. I loved it because of my colleagues. I don't know if I will ever teach with a group so committed to their kids and so fun to be around. Dawn, Marie, Nik, Elaine and I had so much fun and I like to think that we made a difference for those kiddos. We were a great team. I loved my classroom. I mean, look at it. Wood floors, paint peeling from the walls, toxic water, a full wall of sunny windows, no AC, ceilings a million feet high. It was charming. I was on the 3rd floor and spent many days running to the 5th floor for lunch or the 1st to make copies. Even in the midst of training for marathons, those stairs made me out of breath. I loved the adventure. From taking kids on field trips using public transportation--Marie and I would sing rap songs really loudly to embarrass them--to learning to snowboard with them. It was something else. Let me tell you though, the school was crazy. It was disorganized and chaotic and people rarely knew what was going on. It got to the point where we would look at each other and shrug our shoulders in understanding when something ridiculous happened--we expected it. But I think that added to it's charm. Now I am in Fairfax which is as far as you can imagine from Boston. And I like it--my school is newly renovated (see lovely painted cinder block walls and tile floor) and oozes with fancy technology. In Boston, my computer and printer regularly broke and took months to fix. Anything not working in Fairfax is fixed in HOURS. Magic. Anything I need for my classroom, they buy for me. And sometimes it's DELIVERED to my classroom. Seriously, magic. The teachers are all excited about teaching and totally committed to what they do. They volunteer for committees and regularly give extra time to the school (no union--crazy!). The kids are nice and sweet--they bring presents on Christmas and say thank you. But there's just something about Boston--something that I'm still not sure I can name. I know I'm going to have a great year here, really, I teach in an almost ideal school. But how can you not love the adventure of the inner city? Boston has the rights to a big piece of my heart, but I am SO excited for the kids I get to meet tomorrow. It's math time. 1. You are welcome for this. Get ready. 2. Finley is a mobile dude. He barrel rolls across the floor and under furniture and can scoot himself in an entire circle. Yikes. And the sleeping at night is still terrible. 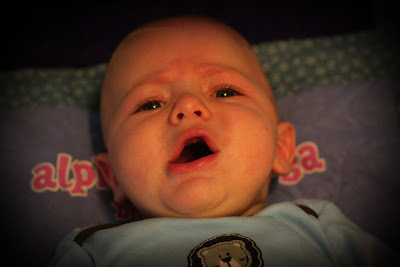 I'm calling our pediatrician because the only thing that is helping at night is Tylenol... poor little baby. I tried, but I couldn't pick a winner of the inaugural giveaway. So just like in elementary school, everyone is a winner! Victoria: Keep on blogging. I love to read your thoughts about your life (and often mine). I love your perfectly photoshopped pictures and snappy writing. You have also inspired me to MAYBE fork over the $10 to buy a domain name. MAYBE. Kristin: You are the first blog I ever followed... and continue to be my favorite. I love LOVE to see pictures of sweet Kate. And you are so thought provoking and genuine--I love to read what you are living. Courtney: You probably should have a blog. You are a funny girl. But because you don't have a blog (YET) here's my advice: cut your hair. I did it. You should too. Emily Gilmore Andrea would be proud. Lauren: Are you kidding? Blogless in the OP is awesome. You need to start that... we'll help you off the ground when you get here Friday! See you soon! Carrie: Well, I believe your sonogram is tomorrow... we probably won't be able to tell if the baby is Asian, but if it is a flightless bird then your blog is MONEY. Other advice, we need to see each other soon. Marie: You left a comment on my facebook wall instead of here... but I'm going to count it. Two pieces of advice. Update your freaking blog. And teach like you mean it. You are fantastic and I miss you. Tara: You also get advice because you linked to me today. One, you are awesome for teaching me about google analytics. I adore data (that is really strange to say...) Two, you are on wordpress... Victoria and I decided that is pretentious and you should switch to blogger. Although our opinion has no basis whatsoever. I recently decided I would like to be a famous blogger. I think I would love the fame and the life of leisure that comes with a blog that turns a profit. Unfortunately, while the temptation of monetizing my blog is great, I don't quite think I have a big enough following to make any money. By my calculations, I have 26 readers on google and 12 followers on blogger. There are maybe 10 people who are ghost readers and follow me secretly... all in all that probably will earn me about zero dollars. Probably not worth cluttering my blog with ads. In light of my relatively small readership, I decided that I am probably not going to be a famous blogger and that I will have to settle for making Finley into a youtube star. While I may only be an amateur blog writer, I consider myself an expert blog reader. And in case you were wondering, I'm about to tell you how to catapult yourself into the outer strata of the blogsphere. So here we go. 1. Have an interesting life. One of the keys to having a big following is having a life that people want to read about. 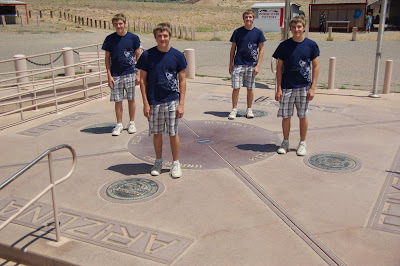 Maybe you live on a ranch, or have quadruplets, or maybe you score off the charts for voice in your writing. Perhaps you bake like an angel or found a clever niche to write about. Unfortunately, my life does not produce the fodder for an exceptional blog. I'm just a mom of a relatively adorable child who teaches and runs and has a dog. And loves Jesus. Probably not going to entice the masses to read. But that's ok.
2. Use lots of hyperlinks. Oh man. Is there anything better than a blog with hyperlinks? Every time I see those pretty hyperlinks I am overjoyed because I know I am about to venture into a new realm of the glorious internet. Today I told Victoria that I always thought cleaning the litter box was like going on a treasure hunt. Which means that hyperlinks are the cat pee in the litter box of the internet. 3. Make outlandish statements. See statement about cat pee above. Outlandish statements make people chuckle or say "that girl is nuts". Either way, they might read your blog again because you are ridiculous. 4. Write in all caps. Using capital letters lets your readers know that a word should have special emphasis, or that you are really proud of your ability to spell said word. For example, I REALLY miss my friends in Boston, but its great making NEW friends here! See? You are intrigued. 5. Strike out text. This is a subtle way of letting your readers know your ability to use html code witty thoughts you weren't sure you wanted to say. 6. Write like you are actually know your readers. This one's a doozy. You should occasionally address your audience. For example... Y'all, my baby is too cute for words. Or... I love this cool weather we're having, don't you agree? In my case, I DO know my readers so at least this is authentic. However, I have NEVER said "y'all" in real life. But it sounded good. 7. Invite guest bloggers. Really, all the cool blogs do it! I inadvertently had a guest blogger... I meant for him to be a co-contributor, but my poor husband barely remembers to check my blog. I can't really expect him to post much, even though his blogging debut was one of the most popular. 9. Give out advice. Like I said above, advice is popular in blogs. I think I am only qualified to dispense advice about math and how to run a slightly faster than average marathon. And how to raise a child to the age of four and a half months. 10. Use words that have at least three syllables. I did a good job of that on this post. And if you can't think of a three syllable word, at least use one that you'd find on the SAT every so often. 11. Include pictures. I'm pretty good at this one--because I have a baby. Pictures are good because then even your illiterate readers can enjoy your blog. See what I did there? I combined two things--it's a picture and it's outlandish! I bet you didn't expect an out of focus picture of me where I look like my neck was broken! Most popular blog EVER! Now go forth and blog. And don't forget to comment to win a piece of advice!